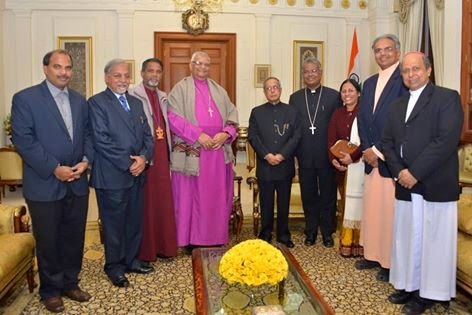 Church leaders representing the National Council of Churches in India (NCCI) and the Regional Christian Council of North West India met the President of India, Shri Pranab Mukherjee at Rashtrapati Bhawan on 24th December, 2014. The Church leaders greeted him on the occasion of Christmas and offered prayers for his health and for the Nation. The leaders also raised their concern with the President about the attacks on Christians in the different parts of the country as well as about conducting of Government functions on 25th December which is a public holiday (Christmas). The President affirmed that India is a pluralistic society and all the religious communities are to be given equal respect. He was very concerned that the social harmony, which has existed for a long time in India, should not be allowed to be disturbed. The delegation consisted of Bishop Subodh Mondal, Bishop of Delhi Episcopal Area, Methodist Church in India; Mrs. Sudipta Mondal; Bishop Collin Theodore, Delhi Brotherhood Society; Bishop Warris. K. Masih, Moderator’s Commissary, Diocese of Delhi CNI; Archbishop Anil Couto, Archdiocese of Delhi Catholic Church; Bishop Simon John, Believers Church, Delhi Diocese; Dr. Sushant Agrawal, Director, CASA; and Mr. Samuel Jayakumar, Executive Secretary, CoP, NCCI. We hope that the President will take some proactive steps in addressing the concerns presented by the delegation.